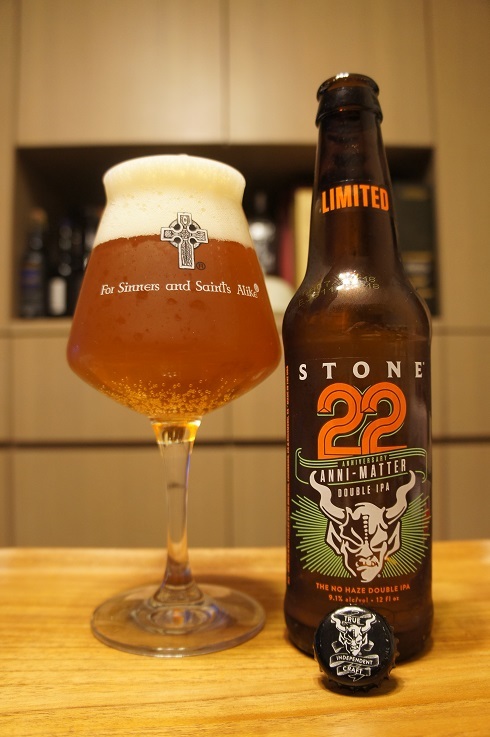 Brewer Description: (from bottle) Stone 22nd Anniversary Double IPA is a clean, crisp perfectly filtered IPA that reinforces giant, juicy, hop forward IPAs are a bailiwick of ours. Every year we have a special recipe creation challenge with two-person teams from our brewing department we’ve called the Stone Spotlight Competition. This year’s winner “Anti-Matter” was brewed (and named) by Stone brewers Jason Smith and Jose Flores. We felt it was a perfect candidate for our 22nd Anniversary IPA, as it’s not only an amazing IPA, but a perfect way to showcase the deep bench that is our talented and dedicated brewing team. This light amber colored IPA features an incredible mouthfeel from the malted oats. Citrus rides in the forefront, with plenty of fruit character to back it up. 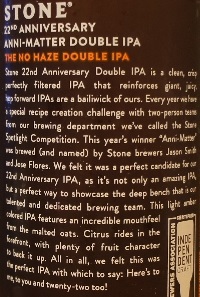 All in all, we felt this was the perfect IPA with which to say: Here’s to me, to you and twenty-two too! Intro: A 12 fl. oz. bottle, bottled on 24th July 2018, and with an enjoy by date of 6th November 2018. Poured into a Lost Abbey teku glass. Appearance: A clear light copper amber colour with an almost two finger white head that had excellent retention and left lots of nice lacing. Aroma: Light biscuit, caramel malts, citrusy orange peel, grapefruit, citrus rind, hints of tropical melon, pineapple and pine. Taste: Moderate bitterness, orange peel, mandarin, light caramel, pine and hints of melon. Mouthfeel: Medium bodied with moderate carbonation and a dry finish. 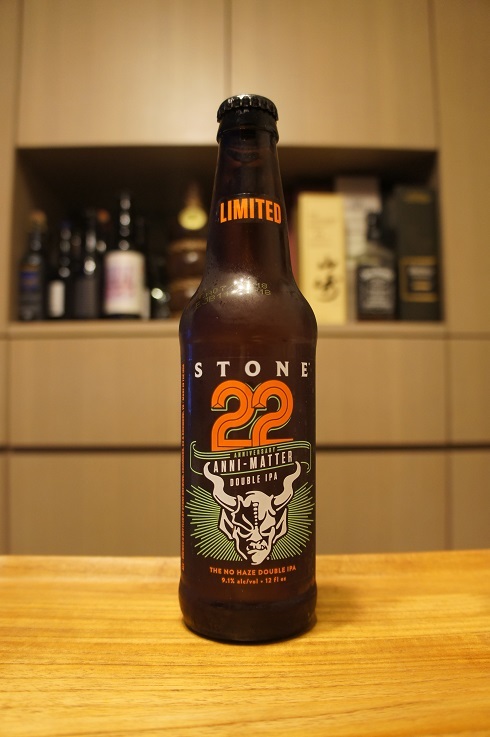 Overall: A good Stone styled Double IPA with nice aroma and flavours. The 9.1% ABV just drinks really easy.